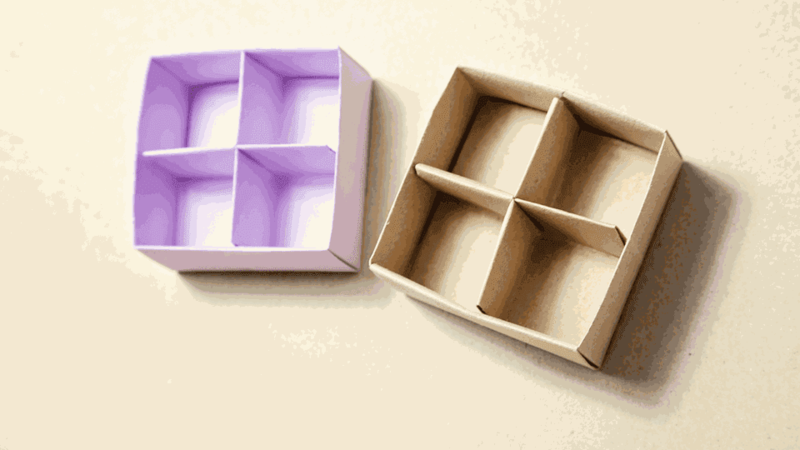 The possibilities are endless with this nifty origami divider! This model is a traditional fold and fits perfectly inside the origami Masu Box that we learned how to fold last time. You may find this origami model a little intimidating at first glance, but it's actually very simple and easy to remember. Traditionally in Japan, Masu boxes are made of wood, used for drinking sake and for measuring rice portions. The origami version is used primarily to give gifts of all different kinds. The divider gives the box 4 equal sections, making it ideal for gifts of sweets like the Japanese 'Mochi' rice cakes. This box with divider would make an awesome organiser for small objects like push pins, sewing supplies or jewellery too! For this step by step photo tutorial you will need a square piece of paper, this needs to be the same size as the paper you used to make the Masu Box. You can learn how to make the masu box by clicking here. Click here for a quick way to get square paper from a rectangle like printer paper. Start with your paper colour side up. Fold the paper diagonally both ways. Turn the paper over (to the white side). Fold the paper in half horizontally and vertically. Get your ruler and measure your paper, divide by three. For example, my paper is 21 cm, so 21 ÷ 3 = 7. Mark your paper at one third in from the bottom left edge. Rotate your paper so that the mark is on the left and fold the bottom edge up to the mark. Unfold the previous fold. Now bring the top edge down to the crease you just made, you now have 3 equal sections. Next we are going to do the same thing with the left and right edges. Fold the right edge over to where the diagonal creases meet, unfold, and fold the left edge to the crease you just made. You now have a grid of nine equal squares. Fold all four corners in as shown. Next, fold all four edges as shown. Hold onto the paper at the diagonal creases, you will be able to squash the model to create a smaller triangle. Fold the top of the triangle down. Open up the model up by unfolding one layer from the bottom. Straighten up the sides as shown in step 23. Finally, fold the model backwards! For assistance with this model, please watch my tutorial video, here. What is a Good Origami Elephant Project? Learn How to Make an Origami Fox Box! How to Make a Japanese Origami Invitation Box! Learn How to Make an Origami Elforia Letterfold! How to Make a Origami Hexagonal Letterfold Using A4 Paper! See How to Do an Origami Candy Box With This Tutorial!